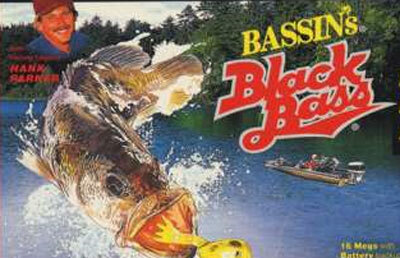 Bassin's Black Bass is a fishing game endorsed by the professional fishing champion Hank Parker. It is another entry in Hot-B's long line of fishing games. Players aim to become a professional fisherman and can travel by themselves or along with Hank. There are four different fishing areas players advance to as they win each round of the tournament. Players travel by boat on the water, select a fishing spot and then select lure and cast fish. Certain types of fish are only available at specific spots. There is also a fish radar that makes a sound when there is fish nearby. Players need to select the correct type of lure (there are about 20), keep track of weather conditions and the limited time available in tournaments. Some fish fight back hard and need to be reeled in with careful timing.